Cunning Stunts has already delivered 27 death-defying Stunt Races alongside a host of new stunt-ready vehicles and more, adding a whole new dimension to GTA Online racing... Now, prepare for an unrelenting barrage of new and outlandish custom Races with today's launch of the Stunt Race Creator. 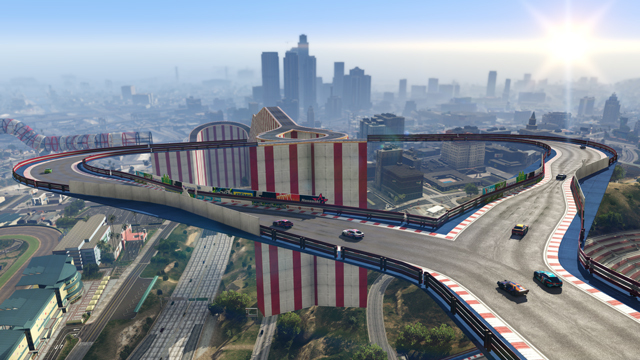 With this latest addition to the GTA Online Creator tool, anyone can build and share their own custom stunt courses with the entire population of racers, stunters and daredevils throughout Los Santos and Blaine County - including options for Standard, GTA, Rally and Non-Contact Stunt Races. The Stunt Race Creator features newly refined tools, allowing you to quickly snap and stack objects together, make branching tracks with split checkpoints, and so much more. Use Raised Tracks, Tubes, Loops and more to make massive ascents and breakneck plummets. With over 250 new Stunt Props now at your disposal, tracks can spiral through the skyscrapers of the Los Santos Skyline, dive through bridges and summit Mount Chiliad. Customize your creation with dangerous obstacles like flaming rings, speed boosts, oversized soccer balls, bowling pins and more. 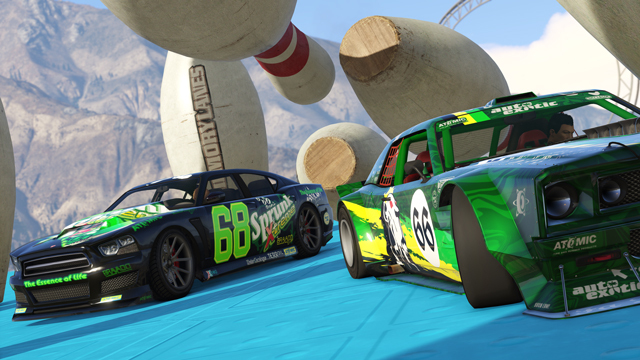 For some general guidance to get you started on constructing and sharing your very own Stunt Races, we've created a handy PDF guide that is available alongside our Creator Guide series at Social Club. And stay tuned for the details on our first official Rockstar Verified Stunt Race contest, happening very soon. Today’s update also brings a brand new Adversary Mode for the combat-ready populace of Los Santos.Entouragerequires tactical teamwork for Bodyguards to transport a well-armored and armed Target to a designated Extraction Point, all the while battling a team of Assassins attempting to take down the Target. The Extraction Point along with all Assassins are only visible to the Target on their radar – the Bodyguards must rely on communication to safely transport the Target and themselves to the goal. 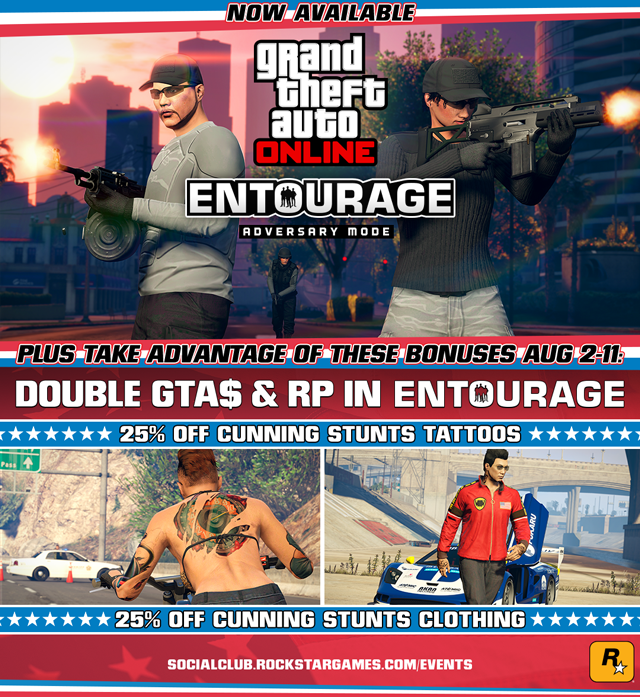 Enjoy Double GTA$ and RP from now through August 11th in the new Entourage mode, including a Featured Playlist accessible from the loading screens when booting up GTAV. And tackle the new Cunning Stunts and user created Stunt Races while sporting brand new ink and Stunt Clothing, all at a 25% discount.